To address and discuss these concerns, an international symposium on light curing in dentistry was held at Dalhousie University in Halifax on May 29–30, 2014. The symposium was attended by 40 key opinion leaders from academia and industry who worked together to develop a Consensus Statement with advice on light curing for practitioners (Fig. 1). The symposium participants were Bob Angelo, Ahmed Abuelyaman, Suham Alexander, Sibel Antonson, Steve Armstrong, Oliver Benz, Uwe Blunck, Ellen Bruzell, John Burgess, Peter Burtscher, Liang Chen, Ivo Correa, Matt Dailey, Colin Deacon, Omar El-Mowafy, Jack Ferracane, Christopher Felix, Reinhard Hickel, Thomas Hill, Neil Jessop, Hilde Kopperud, Daniel Labrie, Hui Lu, Lori Moilanen, Bernhard Möginger, John O'Keefe, Joe Oxman, Frank Pfefferkorn, Jeffrey Platt, Richard Price, Jean-François Roulet, Fred Rueggeberg, Janine Schweppe, Adrian Shortall, Howard Strassler, Jeffrey Stansbury, Byoung Suh, Andreas Utterodt, David Watts and Stacy Wyatt. The support of Benco, BISCO, BlueLight Analytics, DENTSPLY, 3M-ESPE, Gigahertz-Optik, Henry Schein, Heraeus-Kulzer, Ivoclar Vivadent, Kerr, Patterson Dental, SDI, and Ultradent is gratefully acknowledged. Al Shaafi MM, Maawadh AM, Al Qahtani MQ. Evaluation of light intensity output of QTH and LED curing devices in various governmental health institutions.Oper Dent. 2011;36(4):356-61. Maghaireh GA, Alzraikat H, Taha NA. Assessing the irradiance delivered from light-curing units in private dental offices in Jordan. J Am Dent Assoc. 2013;144(8):922-7. Santos GC Jr, Santos MJ, El-Mowafy O, El-Badrawy W. Intensity of quartz-tungsten-halogen light polymerization units used in dental offices in Brazil. Int J Prosthodont. 2005;18(5):434-5. El-Mowafy O, El-Badrawy W, Lewis DW, Shokati B, Soliman O, Kermalli J, et al. Efficacy of halogen photopolymerization units in private dental offices in Toronto. J Can Dent Assoc. 2005;71(8):587. Barghi N, Fischer DE, Pham T. Revisiting the intensity output of curing lights in private dental offices. Compend Contin Educ Dent. 2007;28(7):380-4; quiz 385-6. Hegde V, Jadhav S, Aher GB. A clinical survey of the output intensity of 200 light curing units in dental offices across Maharashtra. J Conserv Dent. 2009;12(3):105-8. Hao X, Luo M, Wu J, Zhu S. A survey of power density of light-curing units used in private dental offices in Changchun City, China. Lasers Med Sci. 2013;May 23, Epub ahead of print. Federlin M, Price R. Improving light-curing instruction in dental school. J Dent Educ. 2013;77(6): 764-72. Price RB, Strassler HE, Price HL, Seth S, Lee CJ. 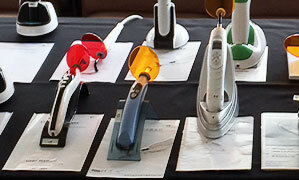 The effectiveness of using a patient simulator to teach light-curing skills. J Am Dent Assoc. 2014;145(1):32-43. Overton JD, Sullivan DJ. (2012) Early failure of Class II resin composite versus Class II amalgam restorations placed by dental students. J Dent Educ. 2012;76(3):338-40. Kopperud SE, Tveit AB, Gaarden T, Sandvik L, Espelid I. Longevity of posterior dental restorations and reasons for failure. Eur J Oral Sci. 2013;120(6):539-48. Sunnegardh-Gronberg K, van Dijken JW, Funegard U, Lindberg A, Nilsson M. Selection of dental materials and longevity of replaced restorations in Public Dental Health clinics in northern Sweden. J Dent. 2009;37(9):673-8. Rho YJ, Namgung C, Jin BH, Lim BS, Cho BH. Longevity of direct restorations in stress-bearing posterior cavities: a retrospective study. Oper Dent. 2013;38(6):572-82. Recognize that all lights are not created equal. Use a LCU from a manufacturer who provides contact information, a user manual, and service. Preferably the LCU should have received a favourable report or certification from a reputable independent 3rd party. (i) the light output (averaged irradiance over the beam incident area in mW/cm2 and spectral output from the LCU), (ii) whether the beam has a uniform and effective output (profile) across the light tip, and (iii) the diameter of the light beam. Be cautious when using high (above 1,500 to 2,000 mW/cm²) output LCUs that advocate very short (e.g., 1 to 5 seconds) exposure times. When used for such short times, it is critical that the light tip is stabilized over the resin during exposure. Although some resin composites are matched to specific high output curing lights, high output LCUs may not adequately cure all of today's resin-composites to the anticipated depth when used for short exposure times. Seek peer-reviewed literature validating the efficacy and safety of such lights and materials. Regularly monitor and record the light output over time, with the same measurement device and light guide. Repair or replace the LCU when it no longer meets the manufacturer's specifications. Inspect and clean the LCU before use to ensure it is on the correct setting, in good working order, and free of defects and debris. Consider that every resin-based material has a minimum amount of energy that must be provided at the correct wavelengths to achieve satisfactory results. [Energy (Joules/cm2) = output (W/cm2) x exposure time (seconds)]. However, minimum irradiation times are also required. Follow the light exposure times and increment thickness recommended by the resin manufacturer, making allowances if you use another manufacturer's light. Increase your curing times for increased distances and darker or opaque shades. Select a LCU tip that delivers a uniform light output across the light tip and that covers as much of the restoration as possible. Cure each surface independently, using overlapping exposures if the light tip is smaller than the restoration. Position the light tip as close as possible (without touching) and parallel to the surface of the resin composite being cured. Stabilize and maintain the tip of the LCU over the resin composite throughout the exposure. Always use the appropriate "blue blocking" glasses or a shield to protect your eyes as you watch and control the position of the curing light. Holding the light tip several millimetres away. Holding the light tip at an angle to the resin surface. Dirty or damaged light-guide optics. Supplementary light exposures should be considered under circumstances that may limit ideal light access, such as shadows from matrix bands, intervening tooth structure, or from restorative material. Beware of potential thermal damage to the pulp and soft tissues when delivering high energy exposures or long exposure times. Air-cool the tooth when exposing for longer times, or when using high output LCUs. Never shine the LCU into the eyes, and avoid looking at the reflected light, except through an appropriate 'blue-blocking' filter. Testing surface hardness of the resin-composite in the tooth using a dental explorer provides NO information about adequacy of curing depth. * Blanket copyright license is given for this information to be freely used, in whole or in part, for all derivative works without permission from the copyright holder.